Computer simulation has the power to enable small and medium-sized enterprises (SMEs) to become more innovative and competitive. However, the cost of purchasing both the necessary hardware and software is often a major barrier to uptake. Help is now at hand in the form of the CloudSME platform, through which simulation software packages and managed IT infrastructure can be rented on demand via a simple pay-per-use model. Computer simulation is a particularly useful tool in fields where it may be difficult to perform 'real-life' tests. 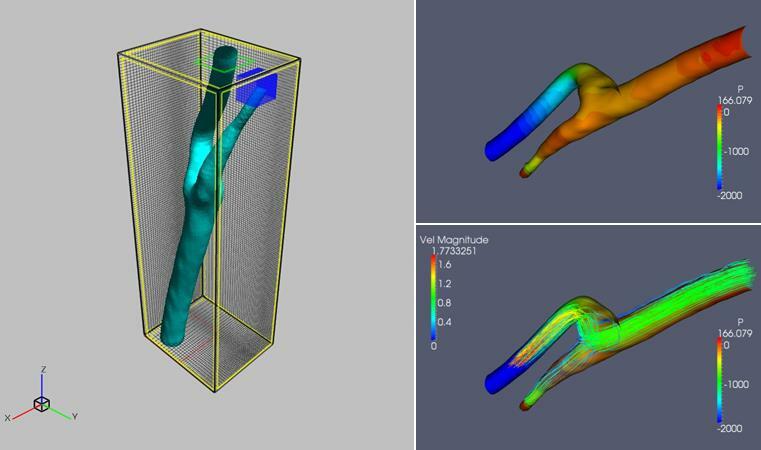 Image above shows simulation of blood flow thorugh a coronary artery. Image courtesy ASCOMP. Computer simulation has the power to enable small and medium-sized enterprises (SMEs) to become more innovative and competitive. However, the cost of purchasing both the necessary hardware and software is often a major barrier to uptake. Help is now at hand in the form of the CloudSME platform, through which simulation software packages and managed IT infrastructure can be rented on demand via a simple pay-per-use model. Industrial progress is characterized by ever-shortening product development times: The period between a new idea being conceived and going to market tends to decrease. At the same time, the variety of products available to consumers is continuously increasing. Investing in product development can be a high-risk activity, particularly for smaller businesses. As such, many companies could benefit considerably from the use of computer simulation to aid them in this process. With the help of computer simulation, diverse business problems can be pre-tested under realistic conditions, thus facilitating informed decision-making. For example, today's computer-aided engineering (CAE) software enables the pre-design of virtual 3D objects that possess the same characteristics as the real product. This not only shortens product development times by eliminating the need to build physical prototypes at each stage of the process, but also reduces costs by detecting potential failures or weaknesses in advance. While simulation technology is widely and successfully used by larger companies, SMEs often cannot afford the necessary software licenses or the required IT infrastructure - simulation can be very computationally expensive. Another common obstacle is a lack of technical know-how. To help SMEs overcome these barriers, the European Commission has funded the CloudSME project under its Seventh Framework Programme (FP7). The project, which is working to create a cloud simulation platform, will enable manufacturing and engineering SMEs to use state-of-the-art simulation technologies as a service via the cloud, in a pay-per-use manner. This approach means that SMEs can reap the productivity benefits of simulation without having to make high investments in software licenses, hardware, and maintenance. Users of the platform won't need to invest time and money in developing technical skills related to cloud computing, but can solely focus on their business tasks, accessing the software via their web browser. The CloudSME platform has been developed over the last 18 months by 16 partners from the UK, Hungary, Spain, France, Germany, and Switzerland. Image courtesy SanderWerbung GmbH. For software vendors, the CloudSME platform also provides the opportunity to use the platform as a public marketplace, drawing more attention to their products. The CloudSME platform has been developed over the last 18 months by 16 partners from the UK, Hungary, Spain, France, Germany, and Switzerland. It will provide access to many commercial and private cloud resources. By connecting to the High Performance Computing Center Stuttgart (HLRS) in Germany, CloudSME will make supercomputing easily available to everyone. The available IT resources will primarily come from European data centers, but other commercial cloud offerings - such as those offered by Amazon - will also be accessible through the platform. The platform will include standard security features, such as encryption, authentication, and authorization security. It will also use European-industry-standard application and server technologies. In short, the platform will offer the right security solutions for a wide variety of needs. To date, four simulation use cases have been implemented on the platform, covering various fields of modeling and simulation (these will soon be made available to the public). For example, one such use case involves supporting computational fluid dynamics (CFD) - particularly in terms of prediction for fluid-fluid and fluid-solid multiphase flows - which is used in many industries. Other current experiments include 3D insole modeling, discrete event simulation for manufacturing and supply-chain optimization, capacity management and maintenance planning, and data mining for the optimization of aircraft maintenance. There will also be special 'one-stop shops' available on the platform, dedicated to specific industries. For example, the Hobsons Brewery in the UK is set to become a new project partner and make use of a template solution for the brewing industry. This simulation work will help them to reduce the beer return rate from local pubs unable to sell all of their stock prior to its 'best-before date'. This kind of solution should also be most attractive for newcomers to computer simulation. At an internal meeting from 28 to 30 January in London, UK, the initial project partners welcomed 13 new companies and research institutes. These new partners will implement seven new use cases on the platform and will contribute their individual simulation solutions and industry use cases to further develop the project's software-defined data center. More information will soon be publicly available on the project website. Additionally, the CloudSME community forum will offer the opportunity to get in contact with other users and developers, providing information and consultancy. Further solution providers who would like to deploy their software on the CloudSME platform are also encouraged to get in touch: a.ocklenburg@cloudsme.eu. Find out more:'Simulation for manufacturing and engineering with CloudSME'.